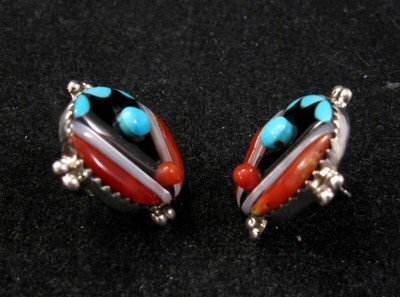 Innovative mosaic inlay earrings by well known Zuni artist, Virginia Quam. This inlay is unique due to the raised surfaces. Virginia Quam uses her own style of artistic colors, shapes and textures. 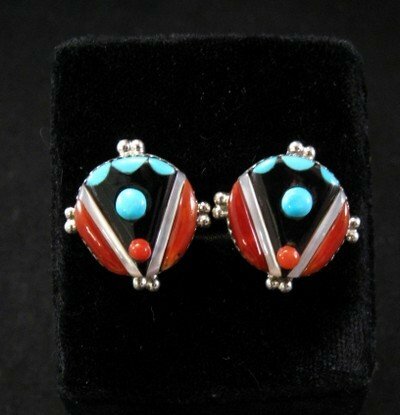 These top quality Zuni hand made sterling silver inlaid earrings are created in Zuni artist Virginia Quam's unique and unusual style. Her inlay has many levels. Her one-of-a-kind inlay technique makes her jewelry highly collectible. She has been making jewelry since before 1975. The earrings measures 3/4 wide at the widest point and weigh 2.5 grams. Brand new in perfect condition. Stamped V. Quam. Certificate of Authenticity included and gift box included with your purchase.